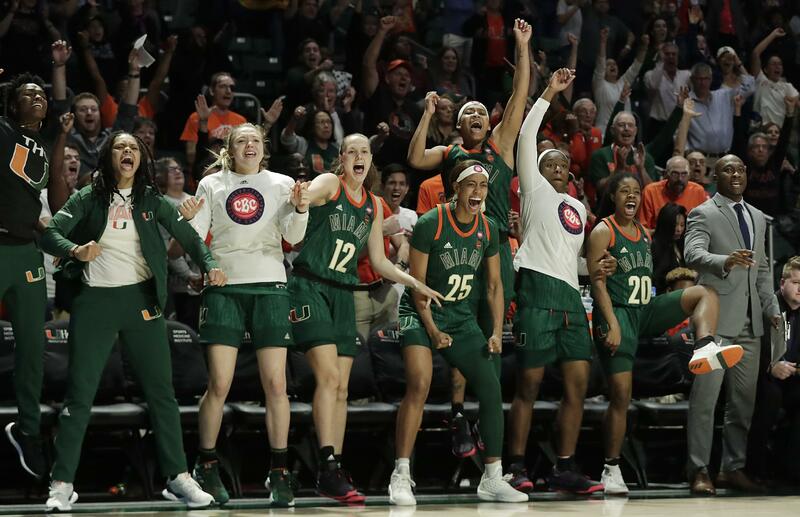 UPDATED: Thu., Feb. 7, 2019, 11:13 p.m.
CORAL GABLES, Fla. – Emese Hof and Beatrice Mompremier had double-doubles for the No. 25-ranked Miami Hurricanes, who applied smothering defense to beat No. 4 Notre Dame 72-65 on Thursday night. LOUISVILLE, Ky. – Asia Durr scored 15 points to help Louisville beat Syracuse. Wearing white-and-black uniforms honoring native son Muhammad Ali, the Cardinals (22-1, 9-1 Atlantic Coast Conference) paid a fitting tribute by landing an early knockout punch. Durr scored the team’s first 10 points as Louisville jumped out to an 18-4 lead less than six minutes into the game. After Durr’s quick start, it was a balanced effort for the rest of the first half as six other players scored at least six points in the half. The Cardinals, who led by as many as 24 points late in the second quarter, also got assists on 12 of their first 15 baskets. They also shot 53 percent in the half and still managed to grab nine offensive rebounds. TALLAHASSEE, Fla. – Nausia Woolfolk scored 22 points, including a career-high tying five 3-pointers, and Florida State scored 10 straight points late in the fourth quarter to knock off North Carolina State. COLLEGE PARK, Md. – Stephanie Jones had 16 points and nine rebounds, reserve Sara Vujacic made all four of her shots during the decisive first half and Maryland rolled past Northwestern for its sixth straight victory. COLUMBIA, S.C. – Nelly Perry led a balanced attack with 13 points and South Carolina warmed up for a showdown with UConn with an easy win over Mississippi. South Carolina got off to a bit of a slow start and didn’t get the lead into double figures until an 8-0 run later in the second quarter. Still, the Rebels (8-16, 2-8), who have lost five straight, only trailed 36-27. IOWA CITY, Iowa – Megan Gustafson poured in 41 points and grabbed 14 rebounds, leading Iowa over Michigan State. COLUMBIA, Mo. – Sophie Cunningham scored six of her 22 points in the final minute of overtime and Missouri ended Texas A&M’s seven-game winning streak. Cunningham had a steal on the opening possession of overtime and then grabbed an offensive rebound that led to Lauren Aldridge’s 3-pointer to give the Tigers a 64-61 lead. Missouri went on to miss its next five shots before Cunningham hit a 15-footer from the right wing with 32 seconds left. AUBURN, Ala. – Rhyne Howard scored 19 points, Taylor Murry added 17 and Kentucky used a hot first half to defeat Auburn. PULLMAN – Kianna Ibis scored 22 points and Arizona took over in the second half to defeat Washington State. Borislava Hristova scored 11 points for the Cougars (7-16, 2-10), who have lost seven straight. Published: Feb. 7, 2019, 7:53 p.m. Updated: Feb. 7, 2019, 11:13 p.m.